Mumbai: As many as 50% of teenage Indian girls are underweight, 52% are anaemic, about 39% still defecate in the open and about 46% do not use hygienic methods of menstrual protection. These are the findings of a new survey report, the Teen Age Girls report (or the TAG report), released by Nanhi Kali, a project by the Naandi Foundation, which works with adolescent girls. As aspirations of teenage Indian girls soar, as we reported in the first part of the series, most of them struggle with gender norms and a lack of ‘new age skills’--such as travelling alone or typing out a document on a computer in English--as we reported in the second part of the series. This concluding part looks at the status of health and access to sanitation, at a time when 63.2 million teenage Indian girls are set to be first-time voters in 2019. The health of the teenage girl holds significance not only for her own life, but also for the health and well-being of the children she may have. The survey covered 74,000 teenage girls from 28 states and seven cities, and asked them questions on nine topics including educational and health status, basic life skills, agency and empowerment within and outside the home and aspirations. A team of trained surveyors collected height-weight data to understand nutritional levels, and haemoglobin data to understand anaemia prevalence. Other indicators were collected through survey questions. As many as 51.8% of teenage Indian girls are anaemic, the survey found. Anaemia is a condition in which a person has a lower-than-normal number of red blood cells or quantity of haemoglobin, which reduces the capacity of their blood to carry oxygen and can lead to a number of health problems, and even death. Low haemoglobin levels lower productivity and cause illness and death, and thus impose an economic cost. The loss of gross domestic product to anaemia was estimated at $22.64 billion (Rs 1.50 lakh crore) in 2016, more than three times the health budget for 2017-18, as IndiaSpend reported in November 2017. Teenage girls in urban areas were more likely to have normal haemoglobin levels compared to rural areas, the survey found. Similarly, girls in households with higher household wealth were more likely to have normal haemoglobin levels. Households are divided into wealth quintiles--five equal parts based on their scores on ownership of consumer goods and household characteristics, such as availability of basic facilities such as clean drinking water. For this survey, the top two quintiles--or, the top 40% households--were clubbed as ‘high wealth quintiles’, while the bottom 60% households were clubbed as ‘low wealth quintiles’. 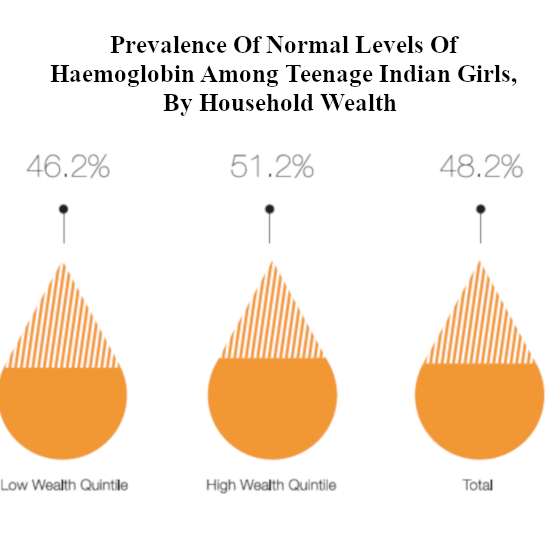 While 51.2% teenage girls in high wealth quintile households had normal haemoglobin levels, 46.2% in low wealth quintile households did. Among the states, Tripura performed the worst with only 35.5% teenage girls having normal haemoglobin levels, followed by Punjab (40.7%), Gujarat (41.3%) and Telangana (42%). 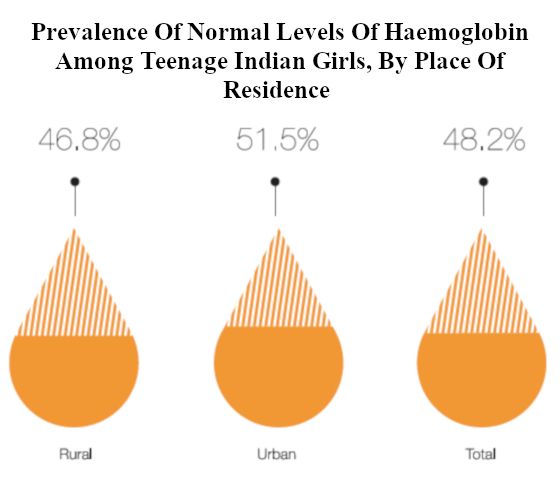 Manipur had the most teenage girls (89.4%) with normal haemoglobin levels, data show. 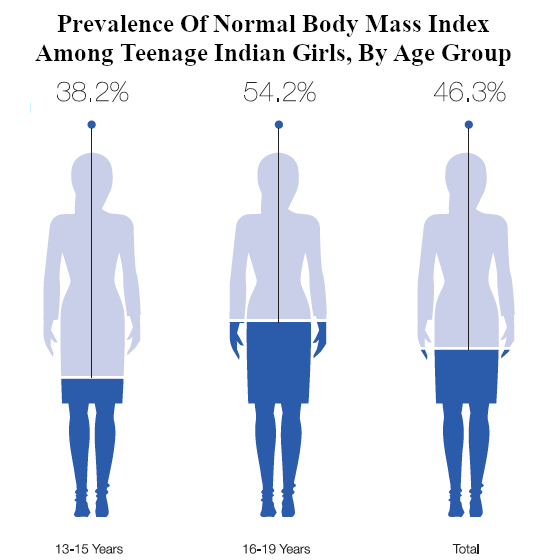 As many as 50.2% of teenage Indian girls are underweight, the survey found using Body Mass Index (BMI)--which categorises people on the basis of weight-to-height ratio into underweight, normal, overweight and obese. While 2.8% are overweight and 0.7% are obese, 46.3% teenage Indian girls have a normal BMI, data show. Much of this stems from undernutrition in their childhood. Around two-thirds of the working population in India are earning 13% less because of stunting in childhood--being excessively short for their age--one of the world’s highest such reductions in per capita income, IndiaSpend reported on August 15, 2018. Impaired brain development, which leads to lower cognitive and socio-emotional skills and lower levels of educational attainment have led to 66% of the workforce earning less than it would otherwise have. While only 38.2% of girls in the 13- to 15-year age group had normal BMI, this rose to 54.2% in the 16- to 19-year age group, data show. 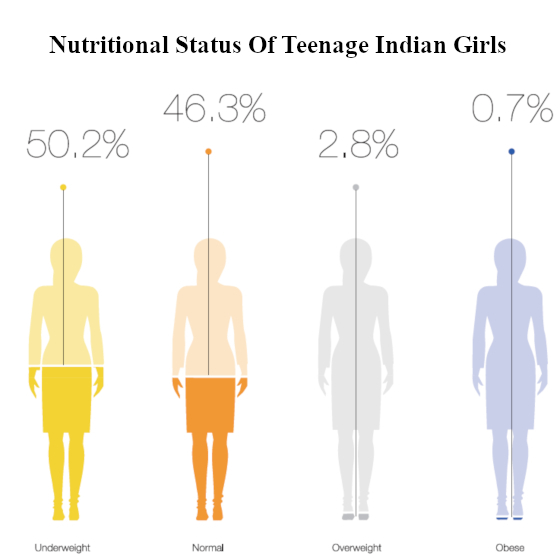 This trend continues after teenage, data from the National Family Health Survey, 2015-16 (NFHS-4) show: 42% girls aged 15-19 years were underweight compared to 14% women aged 40-49 years. Similarly, girls in urban areas were more likely to have normal BMI levels compared to their rural counterparts. 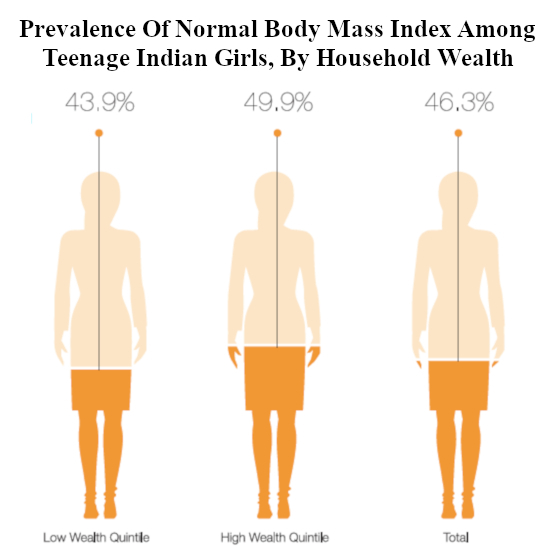 While 49.9% girls in high wealth quintile households had normal BMI, 43.9% in ow BMI households did. Among the states, Bihar performed the worst with only 39% teenage girls having normal BMI, followed by Madhya Pradesh (39.7%), Telangana (40.6%) and Jharkhand (42.9%). Manipur had the most teenage girls (79.4%) with normal BMI, data show. “The causative factors for low BMI and anaemia cutting across socio-economic classes for teenage girls include the nature of status of the woman within the family, prevalence of superstitions and lack of awareness on what constitutes as good health,” Rohini Mukherjee, chief policy officer at Naandi Foundation, told IndiaSpend. Further, seven in 10 girls aged 15-19 years said they had at least one problem in accessing healthcare. Problems cited ranged from getting permission for treatment to unavailability of medical providers and drugs. As many as 39.8% teenage Indian girls still defecate in the open, the survey showed. While 41.5% girls aged 13-15 years said they defecate in the open, 38.2% in the 16- to 19-year age group said so. While 49% girls in rural areas said they defecate in the open, 18% of their urban counterparts said so. Girls with higher household wealth were less likely to defecate in the open, data show. Other is that traditionally, having an attached toilet and bathroom has not been a practice and thus defecating being a private act, the girls feel shy to use the toilet. “Use of toilets, we all agree, must be easy and comfortable, but when it comes along with a whole lot of a hard work, they prefer older practices,” said Mukherjee. Inadequate sanitation--management of human excreta, solid waste, and drainage--costs India Rs 2.4 trillion ($53.8 billion) every year in losses due health, damage to drinking water and tourism costs, as IndiaSpend reported in January 2018. Inadequate sanitation is one of the major causes for incidences of diarrhoea, under-five mortality and stunting among children and as for adults, improved sanitation practices will help them be more productive, ensuring more food and income for the family. Jharkhand performed the worst with only 34.9% teenage girls saying they do not defecate in the open, followed by Bihar (36.9%), Gujarat (40.5%) and Odisha (42.2%). Kerala had the most teenage girls (99%) who do not defecate in the open, data show. Only 54.4% of teenage Indian girls use hygienic menstrual protection, the survey found. Sanitary napkins, tampons and menstrual cups are classified as ‘hygienic protection’, while unhygienic practices include use of cloth, cloth pads and other local material. As many as 45.5% girls said they used cloth or cloth pads. The use of hygienic menstrual protection was more likely among girls in urban areas, the survey found. Similarly, while 71.6% girls in high wealth quintile households used hygienic methods, only 42.6% in low wealth quintile households did so. “There is an understanding on what are improved methods of menstrual protection even though they may not call it that way, and all the girls certainly aspire to use a branded pad,” said Mukherjee. Even though the pads have reached the remotest markets, affordability remains a major issue, Mukherjee told IndiaSpend. As many as 70% mothers still consider talking about menstruation a ‘dirty’ subject, as IndiaSpend reported in July 2018. Tamil Nadu ranks on top for best menstrual hygiene practices with 97.1% girl practising hygienic protection methods, while Uttar Pradesh with 35.3% performed the worst, followed by Bihar (37.8%), Gujarat (40.1%) and Madhya Pradesh (40.9%).